Geotripper: Weather a Bit Less Strange? 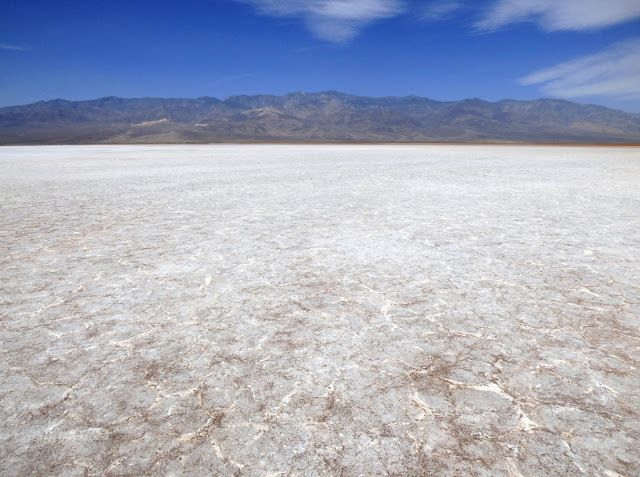 Death Valley in the Last Two Days: Hot! Weather a Bit Less Strange? 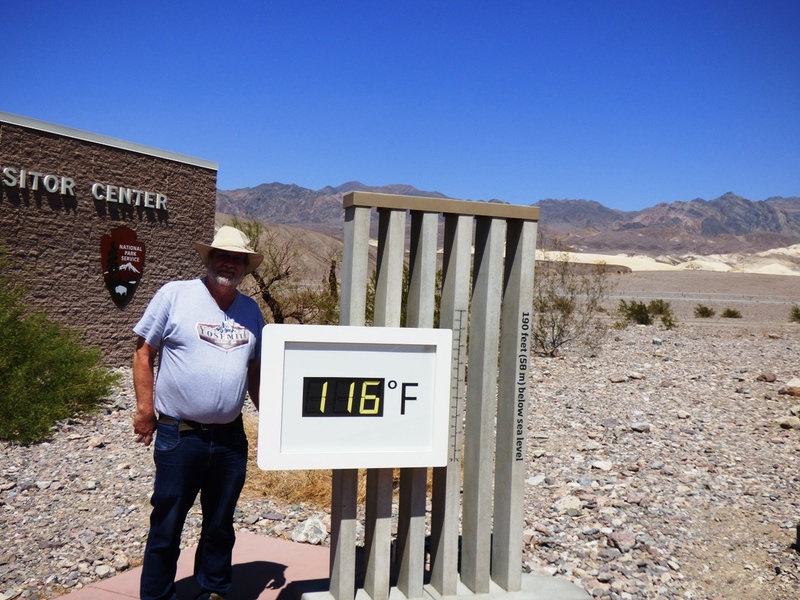 Death Valley in the Last Two Days: Hot! There is, of course, hardly such a thing as "average" weather, just like there is no "average" precipitation. I'm pretty sure that the number of days in a given year that actually match the average temperature is limited. 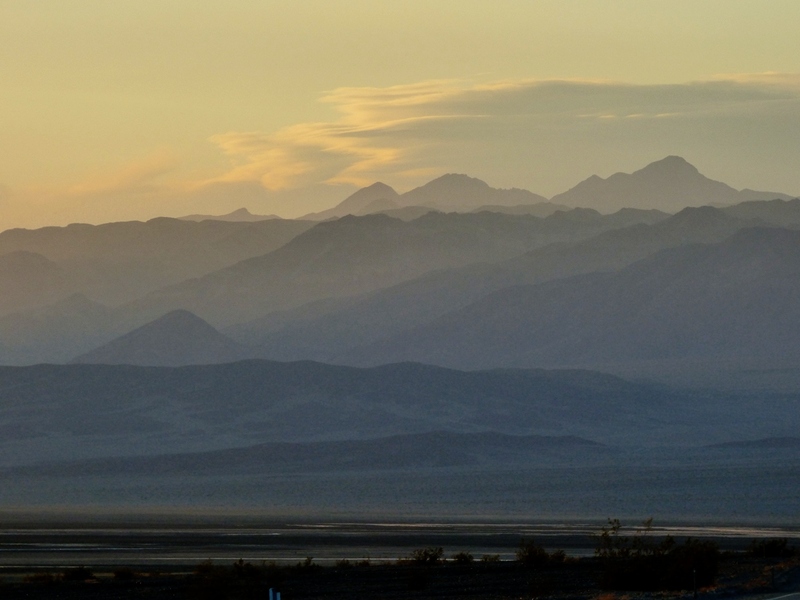 I've been to Death Valley twice in the last two weeks; for Memorial Day weekend, when the temperatures were very cool, like twenty degrees below average, and rainy. I was back there during the last two days, and conditions had taken a thirty degree swing in the other direction, hitting as high as 118°f on Sunday afternoon. It cooled to only 87°f overnight. Average for this time of year? 105°f for the high, and 77°f for the low. I like to think of myself as a desert rat since I'm out there seemingly all the time, but it's not exactly true. 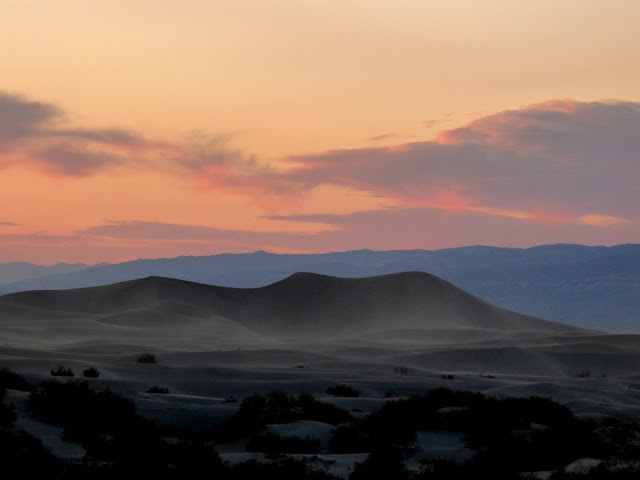 I visit deserts most often when they are a great deal more amenable to human existence. Like Death Valley in winter. I live in a place that gets plenty hot sometimes in summer, but the term "hot" is defined by temperatures topping 100°f maybe a dozen days over the summer. The hottest temperature we've ever had at home was 113°f. So spending an afternoon at 118°f was a new experience. It wasn't fun. I don't like thinking about having a vehicle breakdown in weather like this, especially since cell phone coverage is very sparse in the park. The sun had sunk behind the Cottonwood Mountains, but the temperature barely budged. Despite the heat, a few people were out on the dunes, but they didn't venture far from the parking area. 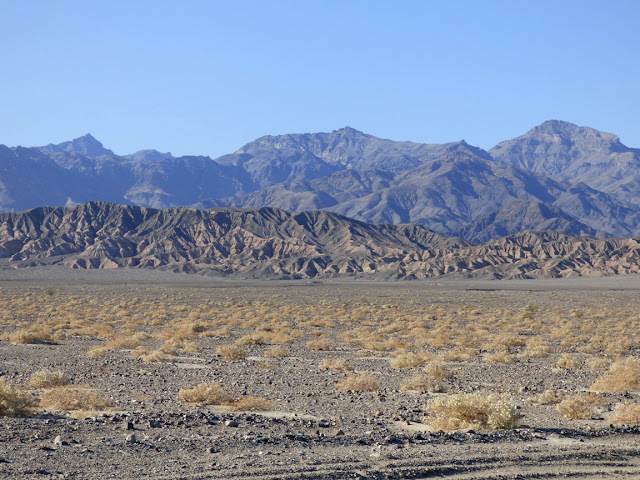 For the first time in twenty-five years of visiting Death Valley I noticed there were no footprints on the highest dune. It was just too darn hot to go that far. 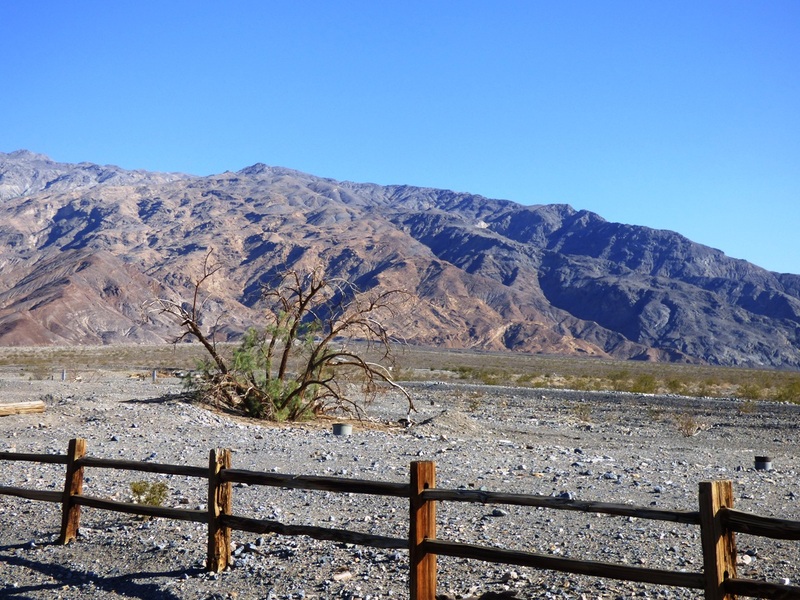 It begs the question then: what the heck was I doing visiting Death Valley in almost-summer? The first visit is easier to explain. I had scored reservations for two nights camping on the North Rim of Grand Canyon National Park (a late cancellation no doubt; the next available dates are in August). That was for Memorial Day and the Tuesday after. But we had to get there somehow with no reservations for any place between my Great Valley in California and Grand Canyon. 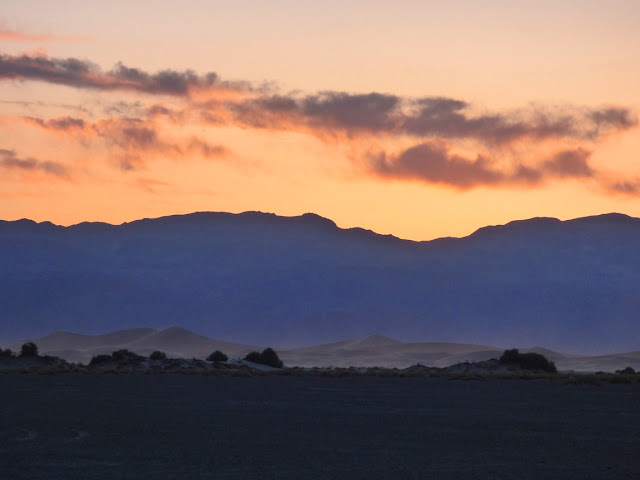 We looked at the weather report for Death Valley and saw that temperatures would be far below normal, so we decided to give camping a try at Furnace Creek. It worked out nicely although it spritzed rain and was windy on the second night. We were comfortable enough. The second visit was for a more unusual reason. 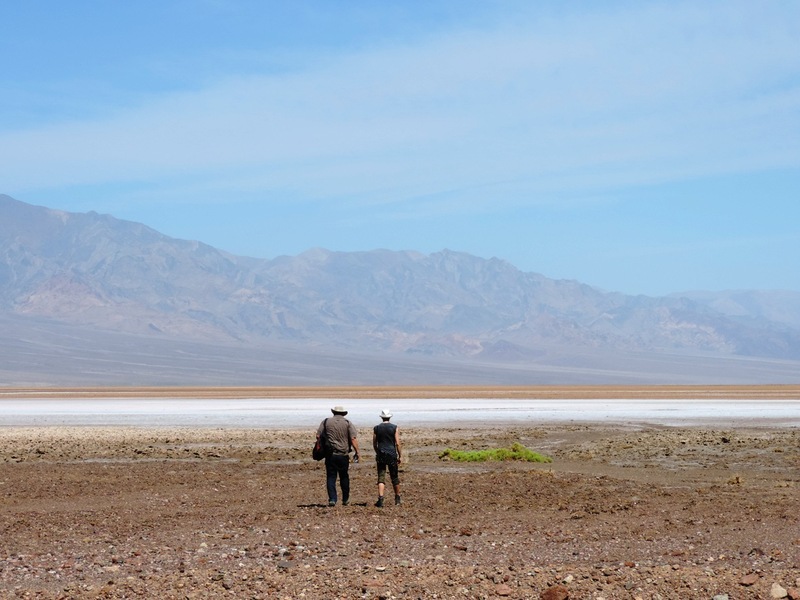 The BBC is working on a documentary on the science of color, and they wanted to use the salt pan at Death Valley National Park as a natural setting for the color white. 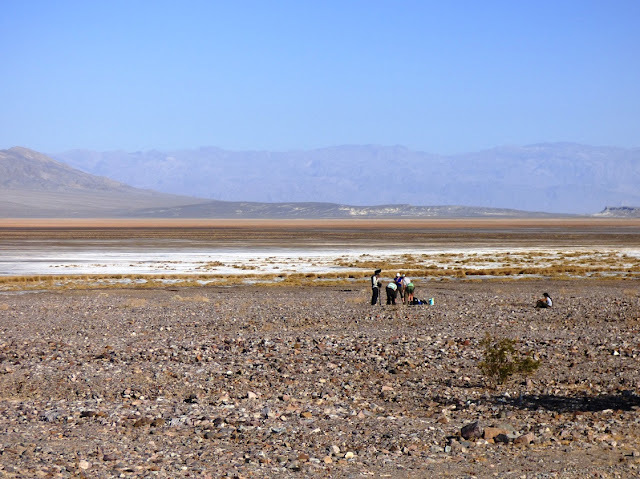 The crew was already headed to the states when they decided they wanted a geologist to explain why the salt is present in Death Valley. Their staff member contacted the folks at AGI (American Geological Institute), and someone there contacted the former director of the NAGT (National Association of Geoscience Teachers), and he remembered something about me visiting Death Valley all the time. The BBC folks were delighted to find out that I was traveling that general direction and asked if I could meet them Sunday at Badwater. We met up, but there was a problem. 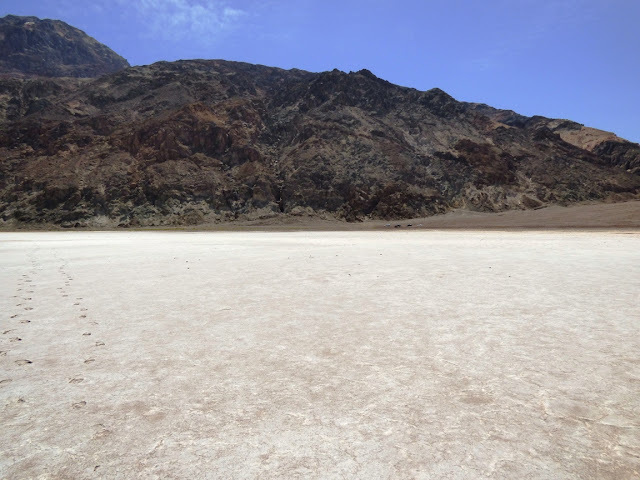 The Badwater salt pan wasn't white! It was mostly a dirty brown color. It seems that California's four year drought has even had an effect in Death Valley, a place that is already the driest spot in North America. 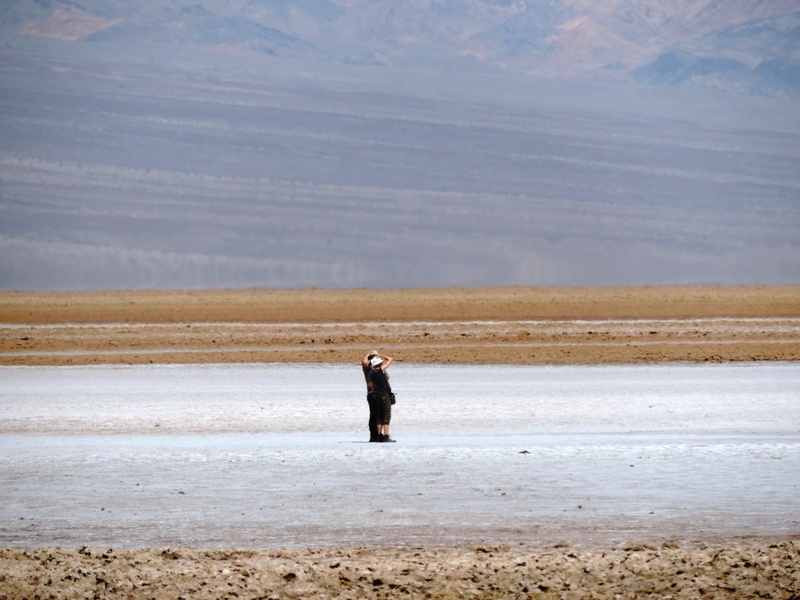 In wet years, the Amargosa River (a usually dry water course that drains much of western Nevada) may flow enough to fill the Badwater Basin with a foot or so of water. The clay settles, the water evaporates, and salt forms a white crust. But there hasn't been a flooding event since 2010 or so, and dust has blown across the surface of the playa (dry lake bed) in most places. It turns out there were a few fairly wide expanses of white salt to the south of Badwater. There haven't been the flooding events, but there are still springs along the base of the Black Mountains that flow onto the floor of the valley and keep the clay wet. Salty water rises through the clay by capillary action, and the moment the water reaches the surface it evaporates, causing the salt to precipitate on the surface of the clay, forming a thin crust. It's not quite like the inches or feet of salt seen at Badwater or the Devil's Golf Course, but it was white and covered several acres, so with a bit of forced perspective, the white surface could be made to seem cover a vast area. We headed out there. If you look carefully, you can see our cars in the distance, a bit right of center. It was a bit cooler in the morning, the high 80s, and the temperature was expected to top out at only 110 degrees. 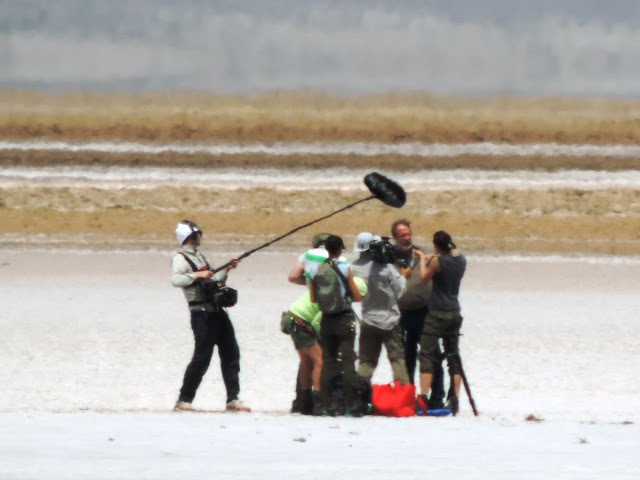 That could be a complication, because the film crew was accompanied by a park ranger who was ordered to shut down filming if temperatures exceeded 110 degrees. No exceptions. 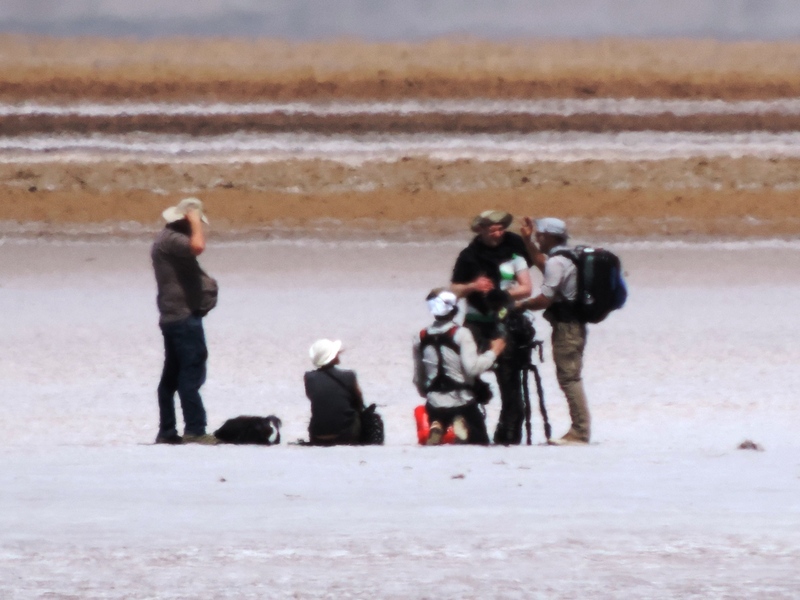 The host of the documentary and I headed out to the salt pan. The sediments of the alluvial fan were cemented with salt and the footing was firm, but as soon as we reached the salt itself, we were actually walking in mud with a thin crust of salt. Any concerns about the temperature were eased, sort of, by the fact that the wind was howling at 20-30 mph or more, and that kept the temperature from soaring. Of course it also made a discussion of the geology difficult to record on the sound equipment. I have my dependable desert hat that has never been blown off my head, but I lost it repeatedly out there. I eventually gave up and did the interview without it. I was discussing geology in the middle of a desert windstorm with the temperature wavering around 110 degrees on a salt flat with a relative humidity approaching zero percent. I went through three water bottles in the two hours we were out there and still got a bit dehydrated. Still, the crew knew what they wanted to accomplish and worked very efficiently. I even got to walk in a circle next to the sound boom so they could have the sound of my boots crunching on the ground. It was mostly unscripted, but the host, a physicist, knew how to draw the information out of me. She asked good questions. We did three takes, and then spent a fair amount of time walking across the hot surface for atmosphere scenes. They finished my part and let me go on my way, but they stayed out there for another couple of hours. They work hard on this kind of thing! "Feel cold for awhile..." Heh. Back in the day, my partner and I worked field ag research in the central valley. As soon as the shift ended before our weekend, we hopped in our car, still in shorts and tank tops, and headed to the Golden Gate Bridge. We'd hop out and stand in the blissfully cold foggy wind for a couple of minutes. The cold felt sooooo wonderful. Hi Gary, I grew up in Merced, and like you said, one can adapt to the heat over time. I always remember the first very hot days that come in April and May and how miserable it was trying to sleep at night, but I loved summer in the valley. I hated our trips to Monterey because of how cold and bleak the summers are, but now I live there, and I can no longer tolerate summer weather ANYWHERE except perhaps northern Alaska haha. Thanks for this interesting post.